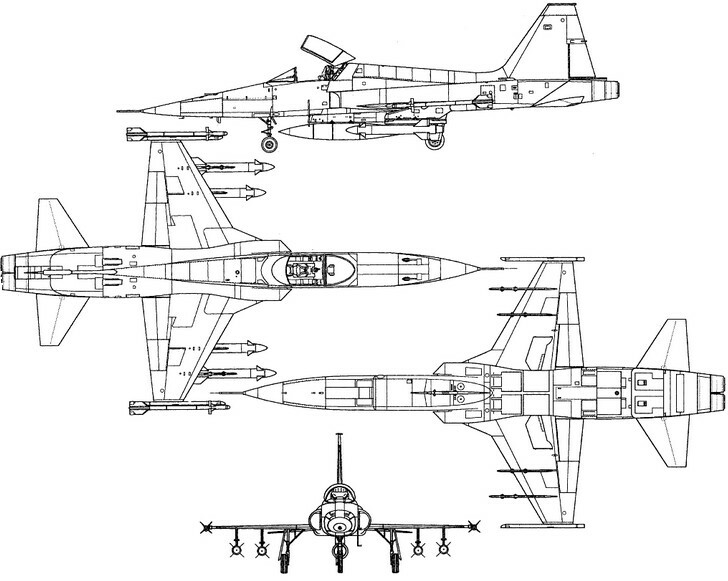 The Northrop F-5 was developed as a lightweight multi-mission aircraft capable of speeds in the area of Mach 1.4. 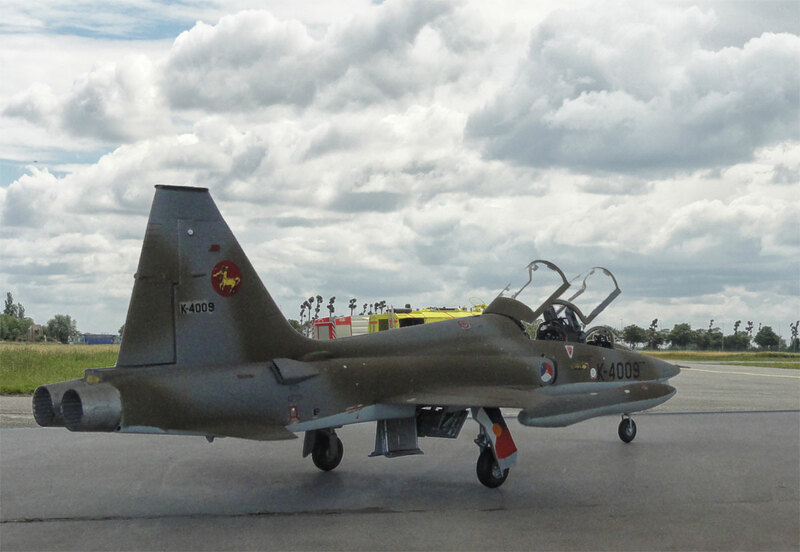 The F-5A prototype, the N-156, was ready for flight test in 1959. Though it was aimed at air forces that had no big budgets available also it was believed the USAF may need the type. But only a dozen were evaluated in Vietnam and no orders came. 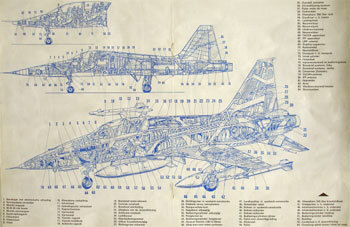 But the USAF did adopt the T-38 Talon trainer that was based on work on the F-5 as the world's first supersonic trainer. 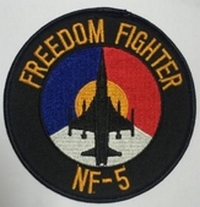 Many F-5 were delivered through the Military Assistance Program to various countries, including many within NATO like Netherlands, Norway, Canada, Spain, Turkey and Greece. 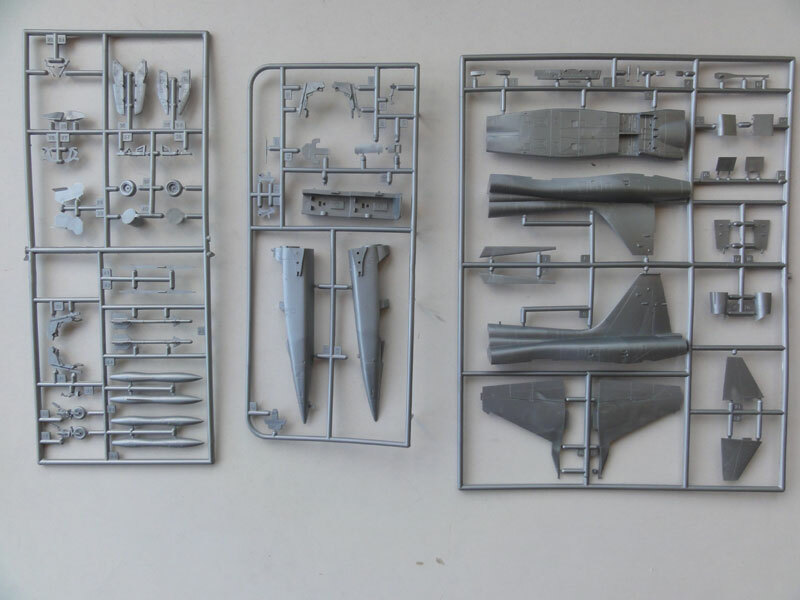 Also F-5A or F-5B orders came in from various nations like Persia Iran, South Korea, Libya, Morocco, Philippines, Taiwan, Thailand, Venezuela and South Vietnam. 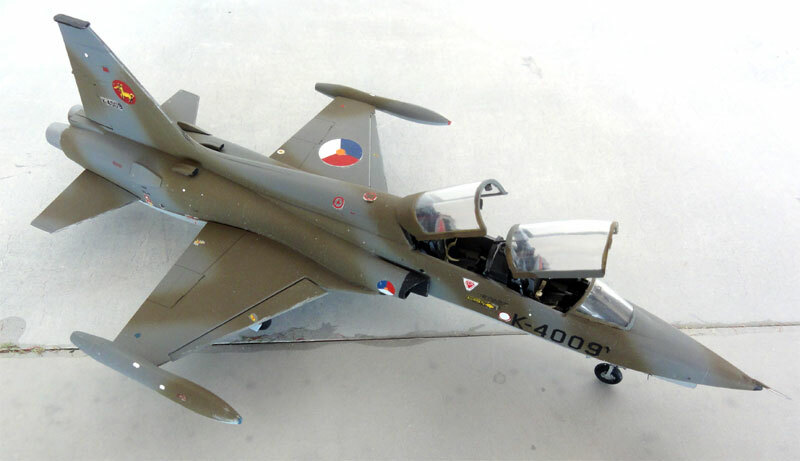 Overall about 650 F-5As and 200 two-seat F-5B aircraft were built. 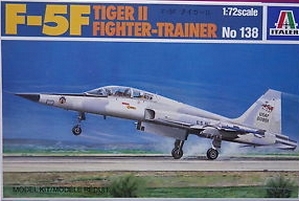 A further development was the F-5E series when the F-5 was used as a starting point for the improved International Fighter Aircraft (IFA) program. 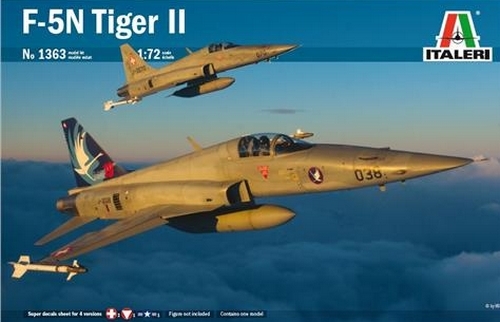 The result was the F-5E Tiger II. Compared to the F-5A, it was lengthened and enlarged, with increased wing area and more sophisticated avionics. 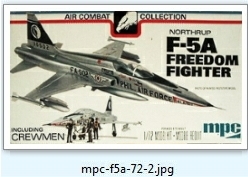 The first F-5E flew in 1972 and many were exported to dozens of US allies that could not buy a very expensive aircraft. 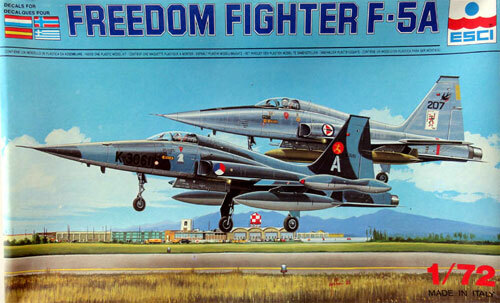 Often also, the F-5E replaced the older F-5's in use in those air forces. 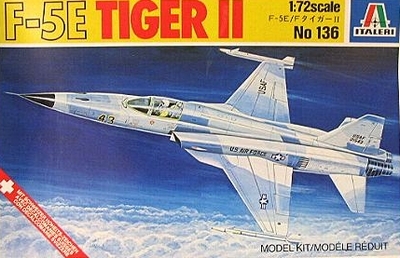 But the better kits are from ESCI that were also found in the later Revell re-issues. (see below) . Some of these kits will be made and this is described on this page 1 up to page 4 . 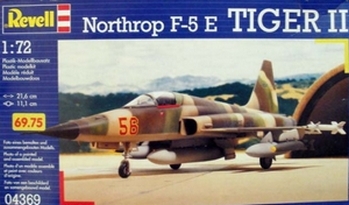 Many of these F-5 Tiger kits will also be made and this is described on pages 5 -> . 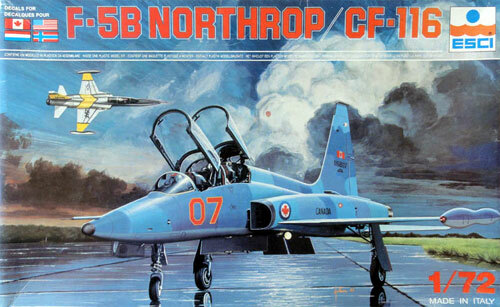 The NF-5 was developed for the Netherlands Air Force ("Koninklijke Luchtmacht" KLu) and was based on the Canadair CF-5. Though very similar to the F-5A, this F-5 version had two more powerfull engines and some extra equipment as compared to the usual F-5A. - other nose wheel leg (that could be extended); this was to take-off with a B61 but later on the extension of the leg was often fixed. 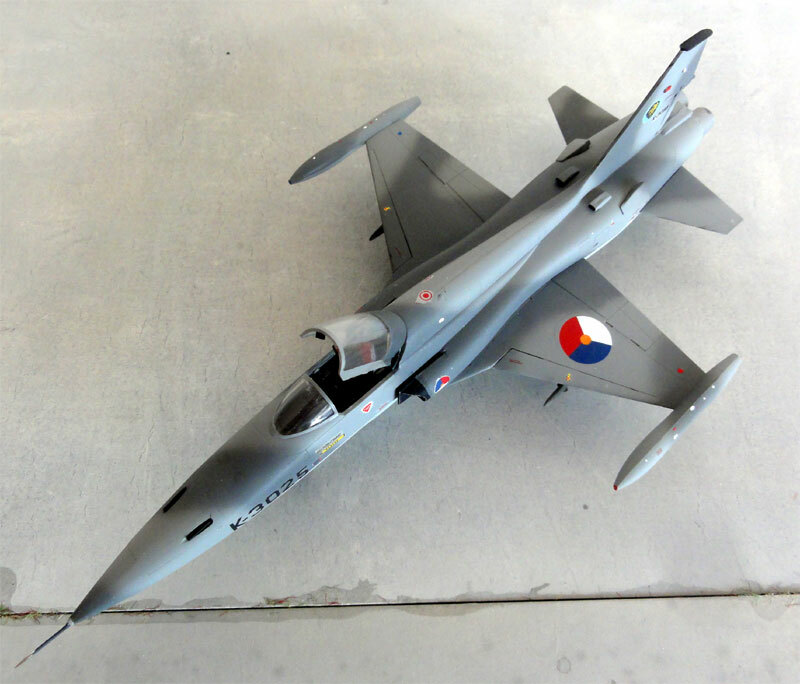 Dutch Air force NF-5's were used as the "multi purpose" ground attack aircraft from 1970 up to 1985. Later, they were replaced with the F-16. These 1/72 models were made in schemes of the Royal Netherlands air force. 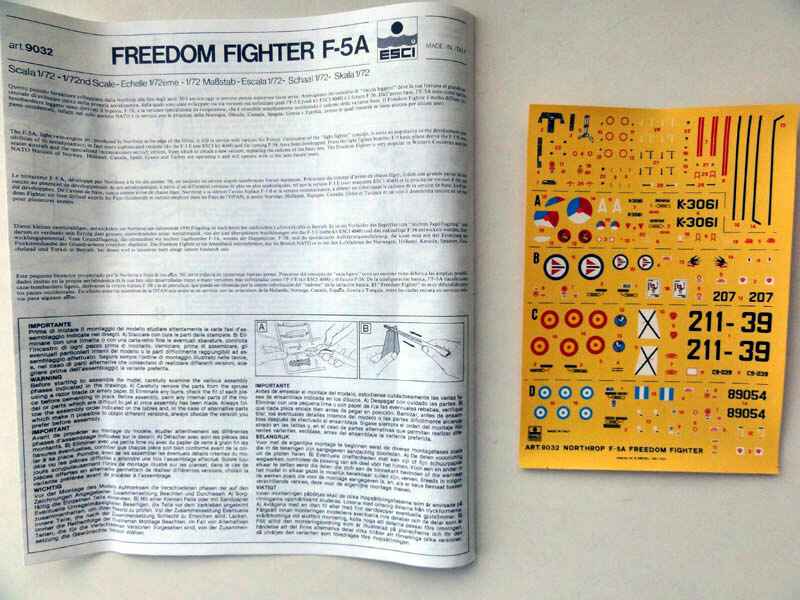 Many years ago, I made the F-5A ESCI kits, no 9032, that were issued in 1988. 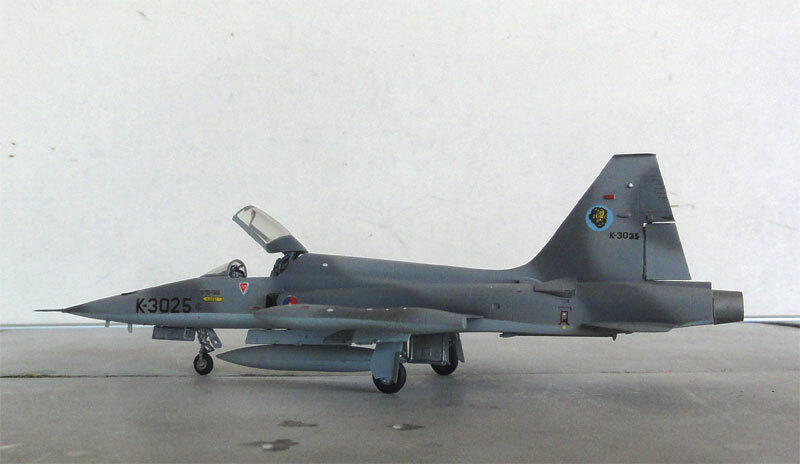 They are very good kits, enabling you also to make the Dutch NF-5 version, this version have a different nose strut and two large flare pods on the rear of the tail section. 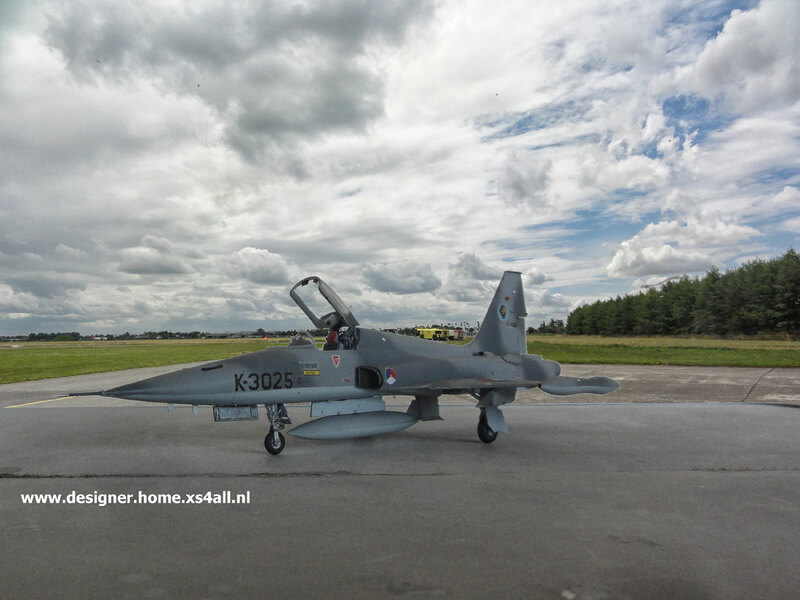 Also, you get the decals for a Dutch AF aircraft. 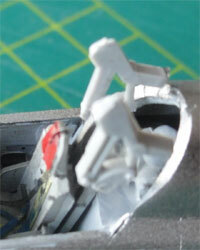 The larger intakes look to be catered for in the NF-5 kits as well as the engraved trailing edge flaps. 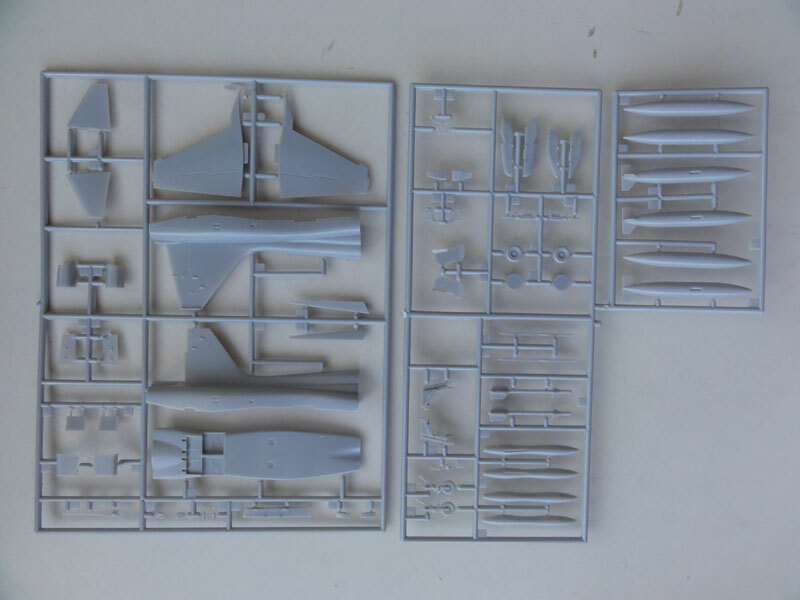 Decals is in the kit are for The Netherlands, Norway, Spain and Greece. The parts are nice but panel lines are raised. Each kit results in a very good representation of the real thing. There is a small error in the inner pylons #36C and 96C next to the main gear. These should be moved 2 mm more outboard than the slot shows. So fill the slots and move them 2 mm when installing these pylons. Landing gear installment is simple. I added some wiring for the hydraulics on the gear legs. 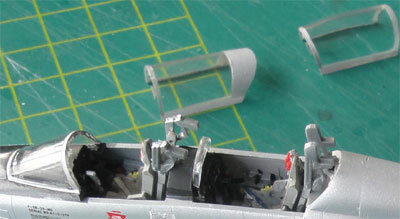 On the wing tip tanks, their tips were painted red and blue. The anti-collision lights are situated on both outher wing areas inside the wing tip. Both on top and below. These lights were suggested with a tiny drop of red and blue paint. 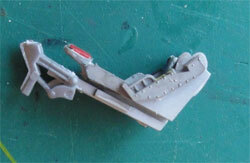 1- open up the exhaust pipes and rear fuselage; the exhaust pipes extend a bit at the lower fuselage edges. 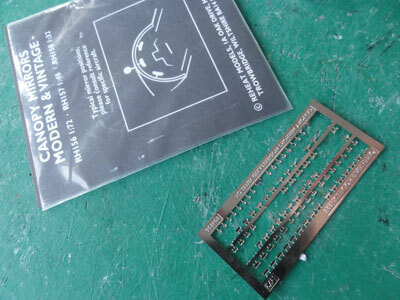 The fuselage depth is about 0,1 mm too small so one could insert a thin piece of card between lower and upper rear section and fill with putty the gap. This would make the rear fuselage a bit fatter. In the kits made however I did not bother further as the small fault is hardly seen. 2- refine nose wheel strut by making a new lower fork at the wheel . 3- detail the cockpit interior with bits and pieces. The seat as per kit is not bad at all. 4- improve canopy setting when set open . I removed the small pips on the parts 26, 27. The mechanism parts were used but installed otherwise. The photos show how. Inside the canopy, at the front frame 2 mirrors from etched metal were installed. These came from a REHEAT mirrorset. 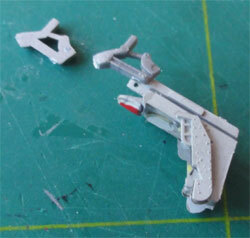 The insides of frames were painted medium grey as well as the mirror' fronts. The inside frames of the canopy were painted medium grey. 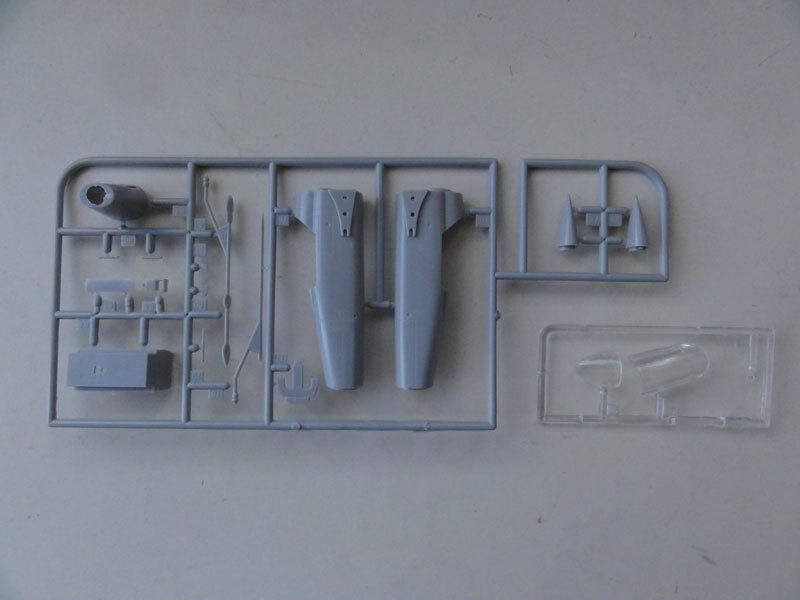 The canopy can be set open in place and fixed with a few drops of superglue, the canopy should NOT be glued to the fuselage, only to the mechanism. Some superglue tends to "fog" a white sheen on a clear part; this is prevented often by covering / dipping the clear part first in a varnish coat of Johnson Future/Pledge. Let dry and set in place 24 hrs later. 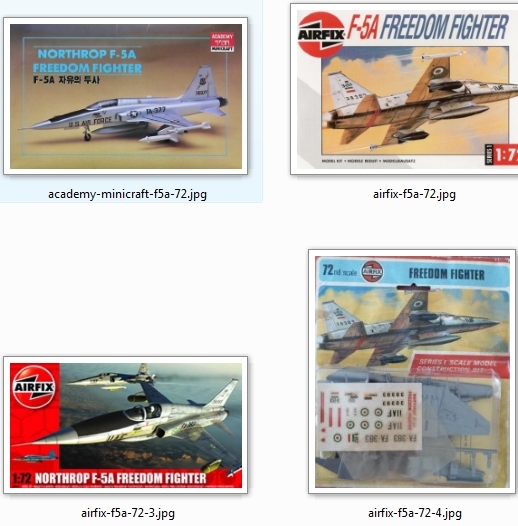 For this Royal Netherlands Air Force (KLu) NF-5A model Modeldecal set 20 was used. The roundel colours of the ESCI kit decals are not correct, so replace them! 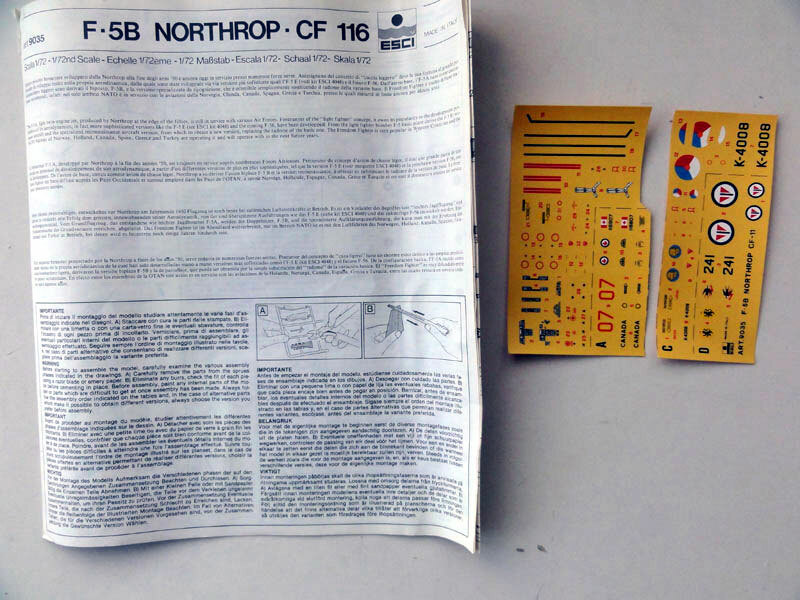 You can also use various Dutch Decal sets for the KLu NF-5. 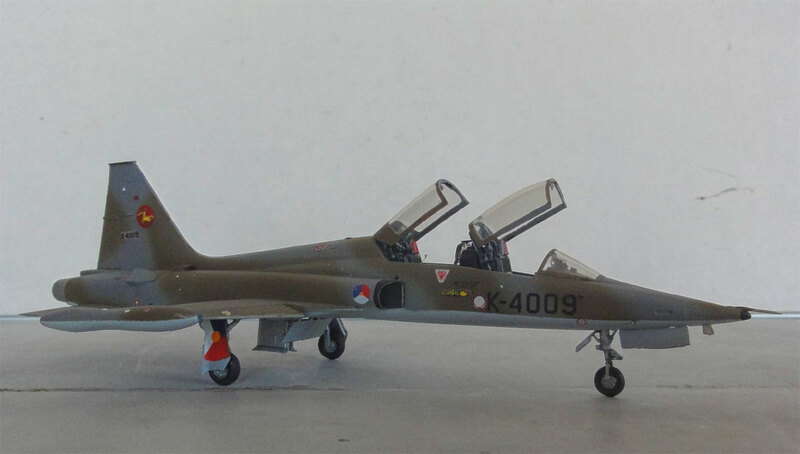 The two seater NF-5B is finished in the older KLu scheme with colours of RAL 6014, 7012. 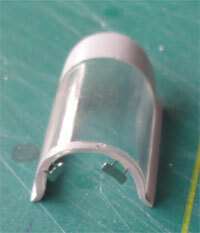 The lower surfaces were originally light grey RAL 7001, later on light aluminium and finally FS 36375. Markings are of 314 squadron of the KLu. 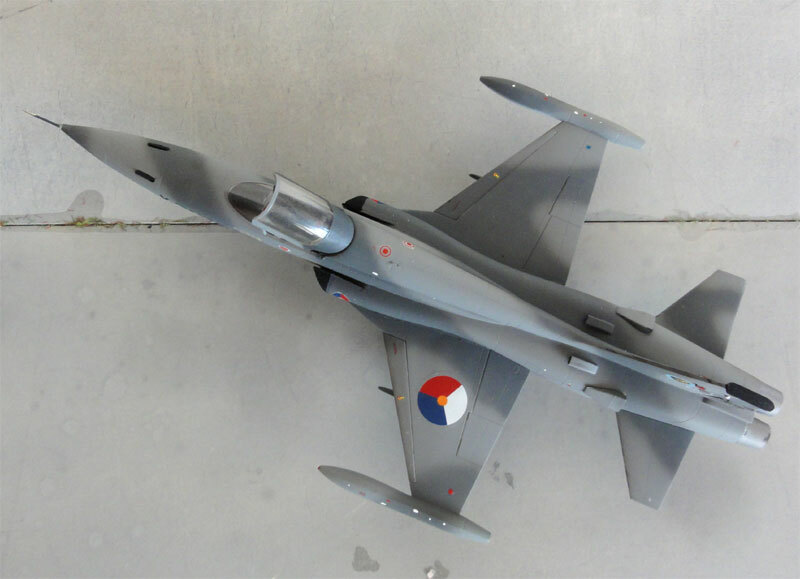 I think I used a mix f decals from the spares box, kit decals and IPMS Nederland decals at the time. For the Light grey RAL 7001 : you can use Humbrol 128 or Xtracolor X255 (lower surfaces). For the Dark green RAL 6014 : Humbrol Xtracolor X251. 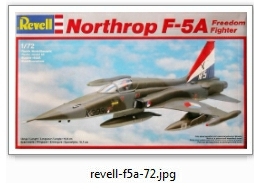 For the Dark grey RAL 7012 : Xtracolor X207 or Revell 77. During air force service especially the dark grey colour quickly faded on mostly the horizontal surfaces with the colours becoming lighter. 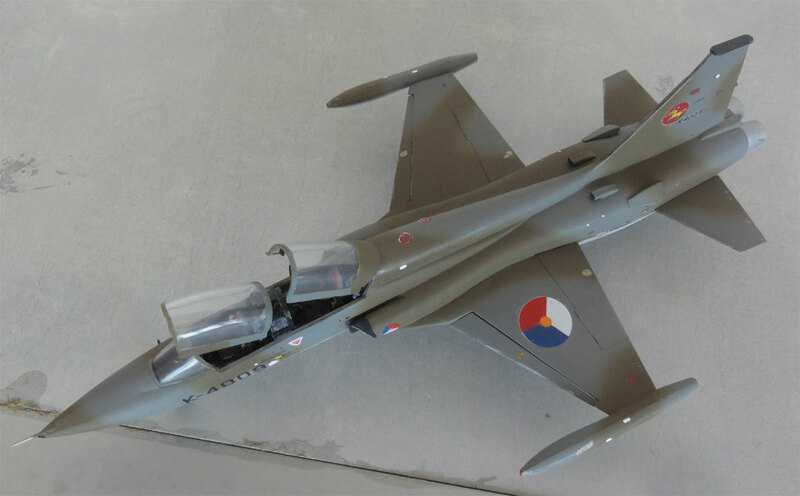 For the faded grey DACO had a colour readily available as for the "Hunter". (Alternatively you can use mix in some white paint with the fresh colours). But this model was made with the full colour. 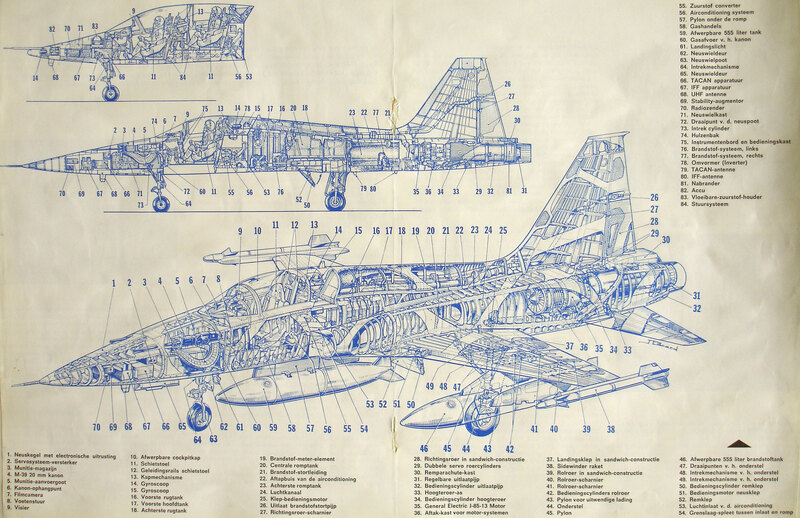 KLu aircraft NF-5B code applied was "K-4009". I removed the small pips on the parts 26, 27 and 60, 61. 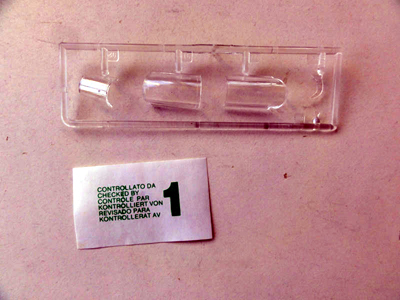 The parts were used but installed otherwise. 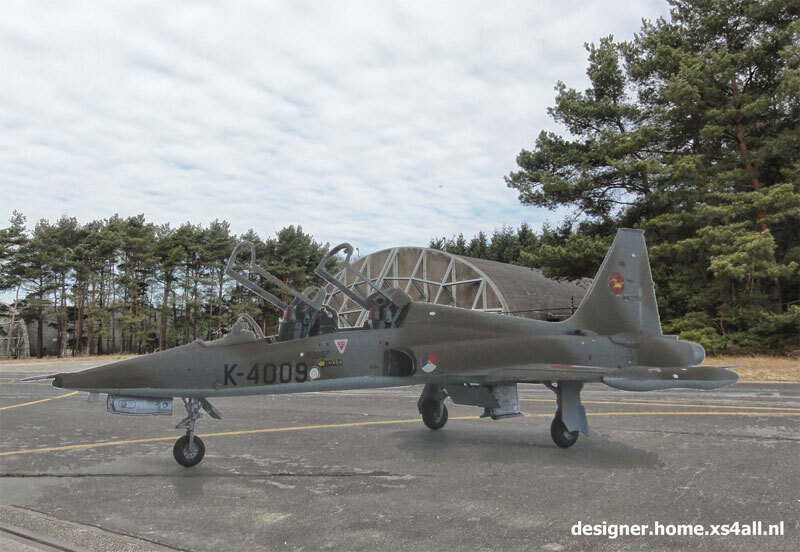 The photos show how I did this with for the forward seat a similar approach as for the F-5A and for the rear seat the parts 60 and 61 were installed a bit different. 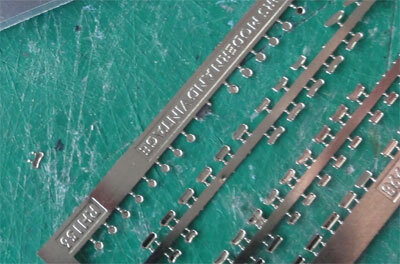 Tiny etched metal mirrors from REHEAT were added in the canopy frames as described for the F-5A. Each canopy can be fixed with tiny drops of superglue.